This election, for many reasons, is perhaps the most important one in America’s modern history. First, our democracy is in grave danger. During the last presidential election and since Donald Trump took office, there have been a systematic attack on our democracy at all levels. The media is being attacked and delegitimized as “fake news” by the nation’s chief elected officer. The intelligence agencies are being criminalized, while minorities and ethnic communities who contributed to our nation’s greatness are being targeted and classified as a burden. Second, the American people are pitted against each other in a way that we haven’t seen since the Civil War. America today is a divided nation at all levels. The recent attacks on immigrants and the brutal separation of families at the southern borders, the Muslim ban and merciless deportation have made a mockery out of America’s justice system. Third, the lack of participation of the American voters in the election process, regardless of the reasons behind this absence from the ballot box, has left the electoral system open to special interest groups, organized lobbies and big corporations to determine our form of governments on the national, state and local levels. The infrastructure of the nation is crumbling even as the healthcare system is failing and becoming more and more unaffordable by more and more Americans. Arab Americans and American Muslims have been at the front and center of a systematic attacks on their very existence and, of course, their civil rights and civil liberties. A recent study by the Arab American Institute and statistics released by the FBI shows clearly that anti-Arab and anti-Muslim sentiments and hate crimes are on the rise. The only way to confront this surge in violence, discrimination and hate crimes is to get involved and to form coalitions with other groups of similar concerns, and they are many. What is refreshing and promising, however, is the interest in public service displayed by many Arab Americans and American Muslims. This election is witnessing a rise in Arab Americans and American Muslims seeking public offices on the local, state and national levels. The recent tally of candidates on the national level has reached a record high of involvements, where more than 90 candidates have courageously chosen to run for election for various positions from U.S. Senate to local municipal offices. In Michigan, the challenge of Islamophobia is strong and evident in the number of candidates who are seeking election this season, not only in quantity, but in quality as well. For the first time a young Muslim and a son of an Egyptian immigrant is running strong for Michigan’s top job. Abdul El-Sayed, 33, is making waves and taking Michigan by the storm with his eloquence, intellect and knowledge. El-Sayed, a Rhodes Scholar and a physician, is changing how both Americans in general and Michiganders perceives Muslims and Arabs. He is raising money and, most importantly, issues and presenting plausible solutions to problems facing all Michiganders, from Health care and infrastructures to education and affordable insurance, among many other things. El-Sayed has solutions for Michigan’s current ills and plans for its brightest future. He will win if we vote. On August 7, Michigan Democrats will get to choose their candidate for governor. We strongly recommend that they give their vote of confidence to Abdul El-Sayed. As Arab Americans and American Muslims roll up their sleeves to fight Islamophobia and government-driven bias against their communities, they need strong allies in Washington, D.C. who are capable of standing up against the White supremacists. U.S. Senator Debbie Stabenow has a proven record of supporting our community and standing up against the Muslim Ban and the Trump agenda. Even though Senator Stabenow doesn’t have a competition in the August 7, Democratic Primary, it is important to cast your vote in her favor to send a strong message of disapproval of Trump’s racist agenda. In the 12th Congressional District, which includes Dearborn, Ann Arbor, Allen Park, Lincoln Park and Taylor, among other cities, voters are urged to re-elect one of the finest representatives in Congress, with a proven record of caring for all Americans and in particular the residents of her district. On August 7, we strongly believe that U.S. Rep. Debbie Dingell’s voting record in Congress for the last two years deserve your support for her re-election. 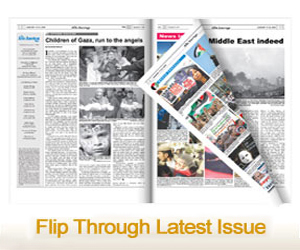 In other races, the Arab and Muslim communities are putting forwards their best and brightest. In Michigan’s 13th Congressional District, which includes portions of Dearborn Heights, Detroit, Garden City, Inkster, Melvindale, Westland and Wayne, among other cities, there are four major candidates vying for the seat vacated by former longtime U.S. Representative John Conyers. Among the major contestants is Rashida Tlaib, a former state representative and a civil rights activist. Tlaib will compete for the seat against Westland Mayor Bill Wild and Detroit City Council President Brenda Jones, among other candidates. Mayor Wild has been a loyal friend of the Arab and Muslim American communities and in absence of Rashida Tlaib, he would be the best and most qualified candidate to fill this important, largely Democratic seat. However, Tlaib has a proven impressive record during her legislative tenure in Lansing and has launched an impressive campaign on issues, presenting solutions. She has proven that a Muslim candidate and a daughter of a Palestinian immigrant can compete in raising funds for her campaign and address issues important to the residents of her district. She can stand up to out-of-control corporate greed and fight racism and discrimination against immigrants and minorities in the Congress. She is a fighter for the poor and underserved. Rashida Tlaib deserves your vote on August 7. Another Arab and Muslim American rising star in the Democratic Party is taking a serious shot at the congressional seat in the 11th District, which is being vacated by outgoing Republican U.S. Rep. David Trott, who decided not to seek re-election. Fayrouz Saad, a daughter of a Lebanese immigrant and a former official in the Obama administration, is seeking to clinch the longtime Republican seat for the Democrats. She has shown a strength in campaigning and in raising the important issues facing her affluent district. She is facing a tough but winnable race against strong contenders such as Suneel Gupta, who was able to raise more money, Haley Stevens and State Representative Tim Geimel. Saad has the experience and the strength to fight racism, defend immigrants, make our country safe and protect our democracy. The 11th Congressional district includes Birmingham, Bloomfield Hills, Canton Township, Farmington, Troy, Northville and Novi, among other cities. On August 7 vote for Faryouz Saad. Two years ago, a young Arab American threw his hat in the ring of public service. As a newcomer to the world of politics, Abdullah Hammoud, the son of a Lebanese immigrants, launched an impressive campaign for a vacant seat in the state house, representing the 15th District. He won decisively and surprised all political pundits. He further gained the respect of his colleague on both sides of the aisle. Abdullah Hammoud’s two years in Lansing have been busy and productive. He cosponsored and authored many resolutions and presented several bills. He represented Dearborn very well and made the Arab and Muslim communities very proud. On August 7, vote for Abdullah Hammoud; send him back to Lansing. Gary Woronchak is a lifelong area resident of Dearborn with strong ties to the Arab American community. He has an impressive professional background that includes 25 years in journalism before being elected in 1998 to represent Dearborn in the Michigan House of Representatives. After three terms in the legislature, Woronchak was elected in 2004 to represent the 13th District on the Wayne County Commission. In 2011, his colleagues on the Commission elected him chairman, a position of trust to which they have re-elected him three times. Now, Woronchak is seeking a seat in the state senate, aiming to replace the term-limited Morris Hood. First- term State Rep. Sylvia Santana is also competing for the same seat. Both candidates are qualified and both are friends to the Arab American community. However, Gary Woronchak has a proven long record of serving the Arab American and Muslim communities in his district, going back to 1998. His achievements include passing the state Halal Food Act that provided consumer protection for Muslims and resolutions of opposition to President Trump’s anti-Muslim policies. He is a loyal friend and experienced public servant. He deserves your support and your vote. On August 7 cast your vote for Gary Woronchak for State Senate in the Third District, which includes Dearborn, Melvindale and a portion of Detroit. As Gary Woronchak vacates his seat on the Wayne County Commission, a well-qualified Arab American is seeking to replace him. Sam Baydoun, a Lebanese immigrant and a longtime real estate broker in the city of Dearborn, has launched an impressive and inclusive campaign. Baydoun has a very successful career in real estate that spans more than three decades. He is a member of many local and national professional organizations, very supportive of the community and a contributor to society. He is a loyal husband and a good father. He has plans to improve the county’s government and is capable of making tough decisions while being a team player. Baydoun is uniquely qualified to lure businesses to invest in the county, create jobs, improve economic developments, repair deteriorating county-owned roads and crumbling infrastructure, while improving safety and quality of life for all residents, especially seniors. He is endorsed by many leaders and elected officials who trust him to lead and serve. We strongly believe that Sam Baydoun will serve Wayne County very well as a commissioner, representing Dearborn and Allen Park. On August 7, cast your vote in favor of Sam Baydoun. 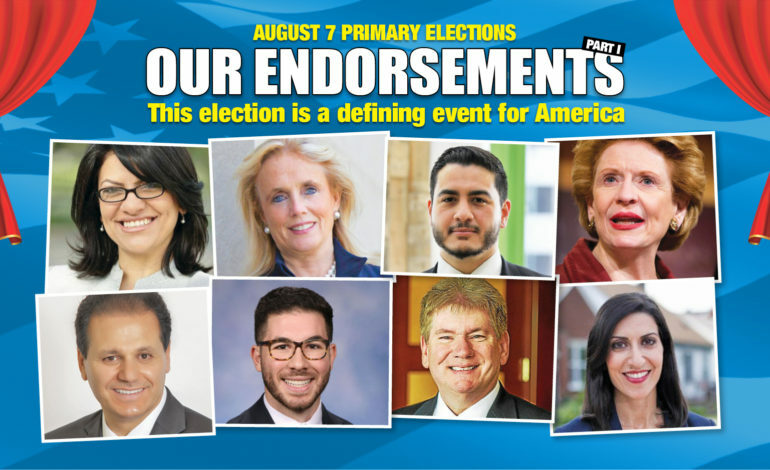 This is a partial list of endorsements by The Arab American News for the August 7 primary. More endorsements for other local, county and state races will be issued next week. In Michigan’s primary elections, registered voters may only vote for candidates from one political party. A ballot will be invalidated if a voter chooses candidates from different political parties.